Potty training is a big step in the life of a child (and their parents!). It’s often a stage that parents dread, as it can be a frustrating and messy task. The key with potty training is to ensure that your child is totally ready before you start. 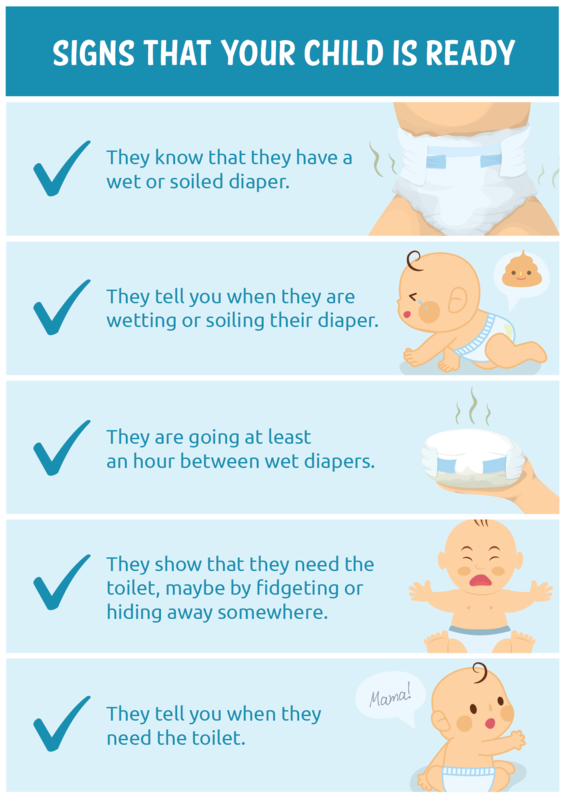 Try too soon and you could end up giving up and going back to diapers, which can be confusing for your toddler. Most children will be ready for potty training at around age three, although it’s important to remember that all children are different and some will be ready earlier or later. Some parents also feel that potty training boys is a more difficult task. As it’s likely to take your child much longer to stay dry at night than it does for them to master daytime potty training, you might wish to focus on daytime training first. They know that they have a wet or soiled diaper. They tell you when they are wetting or soiling their diaper. They are going at least an hour between wet diapers. They show that they need the toilet, maybe by fidgeting or hiding away somewhere. They tell you when they need the toilet. Prepare yourself for three days at home with your toddler. Don’t plan any outings and discourage visitors – you need to be totally focused on the task in hand! You might also want to prep your home. Cover your sofa with an old blanket or towel and pop a waterproof sheet on your child’s bed. Get your child to say goodbye to his diaper and hello to his potty. Explain clearly that they need to go to the toilet in the potty from now on. Forget pants. Leave your child bottomless to make going to the potty quick and easy, as well as being a reminder that they don’t have a diaper on. Give your child an extra drink with breakfast and then encourage them to use the potty. Ensure that your child always has a beaker of water nearby and encourage them to drink plenty through the day. Encourage your child to sit on the potty every 15 minutes, throughout the day. Try not to get distracted – you could set a timer if it helps. Give lots of praise every time your child sits on the potty – whether they use it or not. Don’t react negatively to any accidents. Just calmly clean up and encourage your toddler to sit on the potty. Don’t give your child any drinks or snacks after dinner. Sit your child on the potty before bed. You could read their bedtime story to them while they’re on the potty, if it helps encourage them to use it. Set an alarm and wake your child up halfway through the night for a potty trip (but remember, it’s likely to take much longer for your child to stay dry at night than it takes for them to stay dry during the day – up to 1 in 5 children aged 5 sometimes wet the bed). Repeat for the next two days!